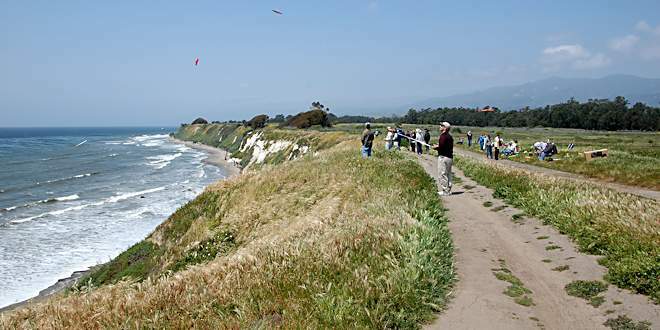 Coastal bluff in W Goleta, CA (west of Santa Barbara). Works best in SW to WSW winds. Santa Barbara Municipal Airport (MesoWest), 2.8 mi. ENE of slope. DW2393 Goleta (MesoWest), 1.6 mi. N of slope. Long and steep 60′ high cliff with a massive grassy LZ. This is the home slope for Weaselfest which is held each spring. Search the RCGroups Slope forum for more information about Weaselfest. Starting point: Junction of the 101 Freeway & Storke Rd. Exit the 101 at Glen Annie / Storke Rd. Go SOUTH 0.2 mi. on Storke Rd. to Hollister Ave. and turn RIGHT. Go WEST 1.1 mi. on Holloster Rd. to Coronado Dr. and turn LEFT. Go SOUTH 0.4 mi. on Coronado Dr. to the dead end and find a place to park. Hike RIGHT from the dead end baracade about 100′ until you come to a path heading LEFT across the creek bed. Take that path across the creek bed and up the hill to the bluff. Continue SOUTH across the bluff until you come to the cliff and turn LEFT. There are many places along the bluff to fly, but the most common place is indicated by the green arrow in the Google Map link above. 34.43444, -119.87083 = Junction: 101 Freeway & Storke Rd. 34.42971,-119.88949 = Junction: Hollister Ave & Coronado Dr.